Celebrate International Women's Day in Milwaukee | Fight Back! 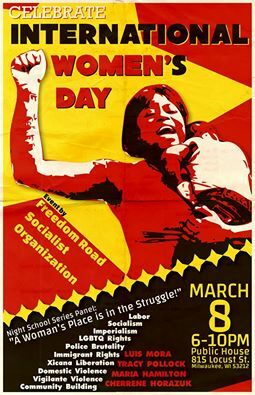 Milwaukee, WI - For over 100 years, International Women's Day has been a day to celebrate accomplishments in the struggle for women's liberation. International Women's Day is coming back to Milwaukee March 8, 6:00 p.m. at the Riverwest Public House, as part of a Night School collaboration with Milwaukee Freedom Road Socialist Organization. There will be food and music, with a $5 suggested donation to Mothers for Justice. The event will feature four panelists, speaking on the struggle against police and white vigilante violence, the labor movement, the immigrant rights movement, and the fight for socialism. "I spent the last week fighting ‘Right to Work’ in Wisconsin and understand more than ever the need to have women on the front line of working class struggles, to raise women's issues within the movements and to have events like this where we get to honor contributions of women and talk about achieving women's liberation," commented Tracey Pollock.